Wow! Do you get your jollies by going around and finding the worst in every place you go? How sad! Did you bother to look at our new Library or the nice Community building or our school or the many nice houses or the new museum building? I pity you if all you see when you go through a community is the worst – and every community has some. We do have a great community – sure we’re struggling to stay alive – What small town isn’t. But we take care of each other, oh, why am I trying to explain anything to someone like you? This is what I call a Podunk Effect. Every other town in this country has a library, a school and a great community. It’s the rest of the stuff that makes a place unique, even if it’s a rusty truck, broken-down gazebo or an old sign. Podunk Effect makes you want to prove that your town is much much better than some visiting idiot made it out to be, even though the visitor is long gone and will probably never be back. He didn’t do his research, didn’t shake hands, didn’t sign your museum’s guestbook, and now everyone will see your awesome town as a giant pile of rusted metal and construction trash. Podunk Effect makes you boil with anger and leave angry comments on the offender’s site to set him straight. Recently an enormous case of Podunk Effect hit Kansas City, when a snarky article about the life of a vegetarian New-Yorker in Midwest was published in the New York Times. But make no mistake: meat-loving is one stereotype that the region wears with pride. Lard still plays a starring role in many kitchens, bacon comes standard in salads, and perhaps the most important event on Kansas City social calendars is a barbecue contest. – blasphemed the alleged heretic (none of it untrue) inadvertently creating a tsunami of righteous outrage. My first reaction to the article was confusion. My second reaction was to laugh. My third reaction was anger. My first reaction to her post was doubt – do people really have three separate reactions in a row? My second reaction was to wonder – what was the length of time in which these three reactions occurred? Was it really fast like “I am confused! Ha-ha! Boo!” or did every stage take some time, maybe an hour or more? My third reaction was amazement – did I just have three reactions in a row? Awesome! 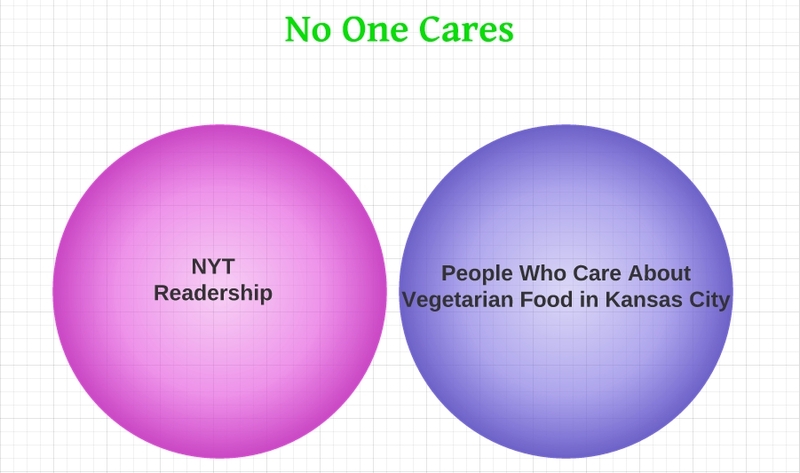 The problem with the NYT article is not the lack of research, or the author taking an easy route of propagating old stereotypes instead of portraying Kansas City as an oasis of vegetarianism in Midwest. The problem is the Pavlovian defensive reaction the article prompted on twitter, blogs, Facebook and even in the local paper, reaction which just like a hurricane in a glass of water is pretty irrelevant in the scheme of things. Because I went to college I will use a Venn diagram to illustrate my point. All the reactions, comments, blog posts and rebuttals are staying here, with an exception of maybe this short note on the New York Magazine’s site, where one succinct comment expressed how most New Yorkers feel about Kansas City. Here is one headline you will never see in print: “New Yorkers are outraged about an unfair article about New York City published in the KC Star“. New Yorkers don’t need our or anyone else’s approval and acknowledgement, so why do we have to get hysterical and make everyone love us just like a podunk Williamsburg,KS? Until we drop small town mentality and just do our thing whether it’s eating meat or tofu, we will always suffer from the lack of self-respect as the city. No one is flying in here for the local vegetarian smorgasbord, it exists mostly for the people who live here and their occasional meat-hating guest. And, to be fair, the meat-loving stereotype served this city well, financially as well as being known as the BBQ capital of the world in the rest of the world. Recently I watched a clip of a Russian show where a lady presented a host with several bottles of the Kansas City BBQ sauce (ironically with all-vegetarian ingredients). That’s not a bad thing to be famous for. One thing this city needs to learn from New York: when you say or do something that a New Yorker doesn’t like, he will show you a finger and move on. We just need to learn to move on. But not before showing the finger.